At the Domaine des Maravilhas we strongly believe that the quality and balance of the soil are essential for our vines to express the highest promises they hold. The respect of the soil founds our approach to cultivating wine at the Domaine des Maravilhas. From the very first planting in 1967 the maintenance of the geological integrity and the organic balance of the soil were vital priorities. This means that the soil never was exposed to herbicides nor to any chemical fertilizers. Furthermore a thick cord of forest keeps the land of the Domaine des Maravilhas safe from any possible source of exterior contamination. Finally so as to avoid the compaction of clay ground the team at the Domaine des Maravilhas regularly ploughs the soil thoroughly and in the fall seeds the land with cereals, grasses and pulses – also known as ‘green fertilizers’. The respect of the vine is another cardinal principle of the Domaine des Maravilhas. The roots need to penetrate the soil deeply to find the clay that is essential to the expression of the maturing wines. To welcome the new plantations the soil must be prepared long in advance so that the young vines may find a healthy and adaptable environment. For the remaining plantations winter pruning is undertaken air as much as possible the foliage and future bunches of grapes. This minimizes stagnant dampness, the major cause of most grape diseases. By doing so the team at the Domaine des Maravilhas significantly reduces the number of necessary phytosanitary treatments during the year. During these treatments teas, brews and decoctions which we make ourselves out of plants and other natural elements are used and strengthen the natural defense mechanism of the vines according to the principles of biodynamics. The Domaine des Maravilhas endeavors to keep a high portion of the land uncultivated (>20%) so as to maintain a natural habitat for the vine insect-pests. This form of culture is very demanding. The quality of our grapes is the best possible reward for all these efforts. 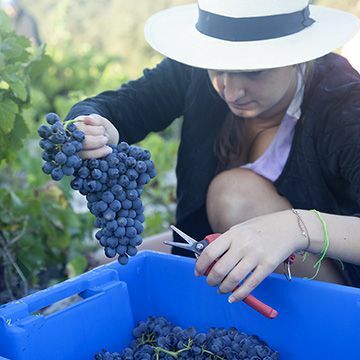 The plots of the Domaine des Maravilhas are located on the ancient alluvial terraces of the Rhône river. These terraces are formed by rounded flint pebbles and red clay lying on a bed of sand and forming an ‘ocean of stone where no earth is to be seen’. The sight of the vines on the vast stretch of big worn stones - some of them so large that it is difficult to hold one’s balance when standing on them - is amazing. The men working this land are determined and patient by nature. Their efforts are essential and rewarding as the soft pebbles are crucial to the terroir. The pebbles maintain the humidity of the soil allowing the vine to resist long periods of drought. They maintain the fine humus layers, which would otherwise be washed away by the heavy rains. Finally the pebbles hold the heat within which the sun gives during the day and give it back to the roots and the berries at night, thereby granting the wine its unique quality. The vines of the Domaine des Maravilhas are planted on the Northern hillside, which is the most exposed to the wind. The vine rows run North-South so as to profit from the beneficial effects of the mistral wind without suffering from its drawbacks. The mistral wind reigns supreme at the Domaine des Maravilhas. Its role is capital. Sometimes the violent gusts are unpredictable and sculpt the mineral and form the vegetal. The vines will however resist the wind and draw from its strength. The mistral is essential to the well-being of the vines, making any trace of rain disappear in the light of the sun after only few hours. Finally the mistral wind sweeps the sky and allows for the exceptional sunshine that is typical for the Rhône valley, pushing the ripeness of the grapes towards the most formidable epitome.